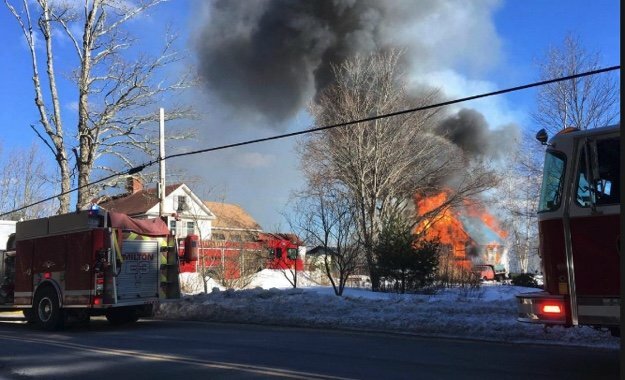 Two firefighters suffered minor injuries in a two-alarm fire in Milton that destroyed a barn and garage Sunday afternoon. Around 3:33 p.m. Sunday, the Carroll County Communication Center dispatched Milton fire personnel to 214 Applebee Road for a reported garage fire. An automatic first alarm assignment was started. Milton police arrived on scene within minutes and reported an attached garage and adjacent barn fully involved extending to the house. Engine 6 arrived on scene at 3:40 p.m. and requested a second alarm. Milton firefighters made an aggressive attack on the garage, attempting to prevent the fire from extending to the main part of the house. As additional crews arrived and a secure water supply was established firefighters began to extinguish massive flames in the 2-story antique barn.